Accommodation for students in Residences, apartments and rooms fully furnished and equipped, for short and long stays in Barcelona. 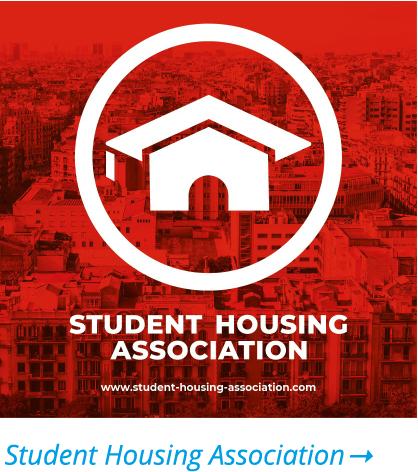 Student Housing, Rent flats Barcelona, rent rooms Barcelona, info student Residence. All flats have furniture and domestic appliances. We have single or twin rooms with private bathroom and common kitchen. Studios with equipped kitchen are also available. You will have access to study areas or chill-out lounges and to a solarium area with terrace and panoramic pool. Other services: WIFI Internet, laundry, cafe-restaurant and 24-hour staff. Safely book your accommodation in Barcelona! HousingAnywhere offers an easy and reliable way to book a room, apartment or studio provided by verified advertisers, online and before you arrive. ÀGORA BCN, a place for study, training and intercultural coexistence attached to the University of Barcelona. Located in a natural environment and well connected: Metro Mundet (L3) and buses H4, 27, 60, 76, B19, N4. It has 220 single and double rooms and a large range of services and facilities. For university students, teachers and researchers. Open to the entire university and educational community. It has a restaurant and also a self-service buffet. The Gràcia Erasmus Residence in Barcelona is located in the heart of the Gràcia district, a neighbourhood highly appreciated by young people and renowned for its restaurants, cafeterias, cinemas, and so on. Gràcia is to Barcelona what Soho is to New York. The Gràcia Erasmus Students’ Residence is well-connected by both Metro and bus. The students’ residence occupies two recently refurbished buildings in the centre of Barcelona, some 500 meters from Parc Güell and the modernista gem Casa Vicens. The Gràcia Erasmus Residence is a university hall of residence which is perfect for both long and short stays. The Student Residence Livensa Living Barcelona is located next to the tram line that leads directly to the Diagonal Sud campuses of the UB, the Polytechnic University of Barcelona and Esade. Single studios from 19m2, with 32″ Smart TV, 120 cm bed, fully-equipped kitchen and private bathroom. Rooftop with an Infinity pool, gym, sauna, studying areas, library, cinema and a sun terrace with city views. At Nexo Residencias we offer spaces for connections adapted to the needs and demands of each student; a community where you can grow as a person and learn every day. Living in our accommodations enables study and rest, providing at the same time a vital enriching experience.